Initial Reaction: "$52 million in funding for the Francophonie Summit? Those old Reform pigs really have turned into humans now. I wonder what Preston 'Snowball' Manning thinks of this budget..."
On Second Thought: "If I was a newspaper editor, I think my headline would read, "Flaherty: Chrétien was Right after all." Carefully targeted regional infrastructure spending? Check. Token funding for the environment, but mostly re-announcing old spending and half-measures? Check. Lowballed financial projections lead to larger than expected surplus? Check. Next year's projections lowballed as well? Check. A variety of carefully targetted tax deductions? Check. OK, that last one was more Martin than Chétien, but poetic license and all that. I honestly think that if you went back and read, say, the 1999 budget and then read this year's one, the only big difference you would see is that, while (core CPI) inflation has been relatively low over 1999-2007, inflation of idiotic rhetoric has apparently been running in double-digits over that period. 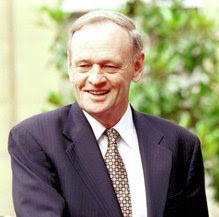 I guess Chrétien won 3 majority governments so perhaps there are worse people to emulate. There are specifically Conservative elements to this budget, of course. For example, only a Conservative government would have the nerve to declare an 'Entrepreuneurial Advantage' program in which 90% of the money allocated is handouts to farmers, but I digress. I have to say, looking at the section of the budget that deals with equalization, the data analyst in me was impressed by how the new plan makes the numbers dance to try and reconcile the numerous conflicting agendas and ideals on the equalization front. * The Equalization program has existed since 1957, and the principle has been enshrined in the Constitution of Canada since 1982. * Equalization payments are entirely funded by federal revenue sources. Provinces do not make payments to each other. * Equalization payments are unconditional. This means that provinces are able to direct these funds to their own priorities. * Equalization payments are made only to the less prosperous provinces. The lower a province’s fiscal capacity, the more per capita it receives. 1) The formula for determining who is 'have' and who is 'have not' will be changed (back) to including all 10 provinces. In effect this means that any of the 10 provinces that have a fiscal capacity below the national average (all except Alberta, Ontario and B.C., currently) will receive equalization to bring their fiscal capacity up to that level. 2) Only half of a provinces natural resources revenue will count towards its fiscal capacity. 3)No province will be allowed to receive any equalization that would make its fiscal capacity higher than a province not receiving equalization. Right now, Ontario has the lowest fiscal capacity (per capita) of any province not receiving equalization so that means equalization for all provinces is capped when their fiscal capacity matches Ontario's. 4) The computation of fiscal capacity has been changed. Where there used to be 33 potential revenue sources considered, now there will only be 5. Property tax capacity will be based on market values of property. Overall, I think the changes are wise. Including all 10 provinces just makes sense. I imagine that the only reason the federal government moved away from that in 1982 was to save costs during the recession. And counting 50% of resource revenue still seems like a government subsidy for fossil fuel use to me, hardly good policy in an era of global warming and peak oil worries. Having said that, much as I dislike them, I can hardly expect the Cons to commit political suicide by entirely abandoning their stupid promise to remove natural resource revenue entirely from the equalization formula. One hazard will be the inclusion of market value of property taxes in the formula, a change which I suspect might be reversed or mitigated somehow in the future as real estate prices are far more volatile than genuine fiscal capacity. It's a mistake, but one that can be fixed at a later date, I suppose. Politically, I doubt this will sell all that well in Atlantic Canada. According to the government's numbers, the changes to the program will result in roughly $1.1B of new equalization funding per year of which $0.7 goes to Quebec, and $0.4B goes to the prairies, leaving $0.0B (rounding) for the Maritimes (of course, there'd be more for the Maritimes ($0.2B) if Newfoundland and Nova Scotia opted in to the new formula, but they probably won't since it doesn't match the sweet deal they already have.) Given that the Cons are also changing the social transfers to the provinces so that they are rigidly fixed to the same per capita amount across the country, the Maritimes will likely come out behind overall on the changes. * Tax relief is generally targeted towards those who need it most. * Changes to equalization won't keep the provinces quiet for long, but they are still generally well done. * Books are still in surplus. Government hasn't blown it all on tax cuts for the wealthy yet. * Government still isn't taking climate change seriously. * What's in it for me? Including property taxes in equalization will hit B.C. pretty hard, even if it is phased in over a few years, I'm not old, I don't have kids, I'm not a trucker, I'm not a farmer, I don't constantly run across the border to buy cheaper stuff in the U.S., boo-hoo. * Increasing truckers meal expense deduction by 30% will cost the government $25 million in 2008-09? That's a lot of lunches. Penultimate word: Times are relatively good these days in Canada on the economic front. Given the circumstances, it would be hard to bring in a really bad budget (although Mike Harris certainly managed it a few times). Harper, Flaherty and co. are working hard in this budget to convince people they are really Liberals and not just Cons in Liberal clothing - I guess we'll see how many people buy it. In the meantime, the budget should allow the country to roll along for another year. Last word: At some point, true right wingers are going to realize that they need a party to the right of the Cons to anchor them to their (nutty, in my opinion, but hey it's a free country) right wing beliefs. A Liberal government opposed by Reform and Alliance leaned right for many years, and now a Conservative government opposed by Liberals, the NDP and the Bloc is leaning left. I know Conservatives have their heart set on their precious (majority) and they're willing to swallow indignities like federal funding for the Francophonie if it means that they can take absolute power for a few years and then bring in some real Conservative policies and stop with this minority tiptoeing around, but I guess that if they don't get that majority in the next try or two their patience might run out. So when the time comes for the Reform Jr. Party to sweep the prairies, split the right wing vote and keep the Conservatives out of power for another decade, I hope progressives will be ready and willing to do their bit to help. * Post updated to note that the one glaring exception to 'taxes being targeted to those who need it' was the tax break for couples with children - all couples even if they are millionaires already. After the last two budgets, one does get the sense that Harper and Co. are much more focused on trying to increase the birth rate than they are on relieving child poverty or ensuring that all children receive adequate care as they grow up. There is a widespread desire for 'more' in our society, and that includes a desire for a country with more power, more influence, and to make all that happen, more people. Of course the last thing our planet needs is more people but, as the budget shows, the Conservatives aren't overly concerned about the planet. I've been vaguely tracking the progress of Mauritania following the military coup there in August 2005. So I was pleased to see earlier this week that the general who was leading the military junta, Colonel Vall, appears to have finished keeping all the promises of democratic reform he made when he took over, with the last step being free and fair elections. The Independent has a good, brief, article on the election and Colonel Vall. Who knows how things will turn out, of course, this is still Africa, but for now it is, as the post title says, a tough day to be a cynic. If you read a lot of Canadian political bloggers, this post by Jason Bo Green is pretty funny. Roy writes about David Frum and the difference between art and propaganda over at alicublog. Via Ti-Guy in the comments on a mildly obscure visual riddle posted by Red Tory. Now, there are lots of reasons why you might expect those earning more to pay a higher marginal rate of tax, one of the main ones being that a relative equal distribution of income is good for society, and another being that progressive taxes compensate for many of the ways in which the rest of the tax system is regressive, but what I'm going to focus on in this post is the concept of minimizing the harm caused by the tax system. Under this argument, it is logical for a person to pay a higher rate of income on, say, their income between $120,000 and $130,000 than they do on their income between $10,000 and $20,000 because there is less harm inflicted on the person by depriving them of more of their income once they have already made a significant amount of money. i.e. As the economists say, there is diminishing marginal utility to income. Or, as non-economists say, taxes which prevent you from buying your third car are less of a hardship than taxes which prevent you from buying your first car. Taxes that prevent you from buying a third home are less harmful than taxes which prevent you from being able to afford rent and food at the same time. Supporters of a true flat tax argue either that this isn't true or that it is true but it is not a big deal (or is the price of progress as high marginal tax rates will send the wealthy fleeing, killing the golden goose that lays the golden eggs and only sleeps on the golden pillow and all that). They argue that it is only fair that everyone pay the same rate of tax on each dollar of income. With a true flat tax, someone who can't afford to even eat properly will pay the same rate of tax on their first dollar of income as someone else pays on their $500,000th dollar of income. I don't know what the number for the second bracket here is, I'm just guessing at 24%, hence the question mark. By supporting the two bracket flat tax, people are acknowledging that the argument I made earlier about harm reduction is valid. That is, they agree that taxes cause more harm to the poor than to those with more money. But what they are also arguing is that this effect disappears at the $8,000 threshold. That is, they are arguing that once you've made $8,000 in income, there is no more diminishing marginal utility to having more income. Or in plainer language, having your income go from $8,000/year to $18,000 year has the same impact on your quality of life as having your income go from $108,000 to $118,000. Or, to put it in language plainer still, the premise of the two-bracket-flat-tax is nutty. As best as I can figure, the two-bracket-flat-tax is viewed as a compromise by advocates. A true flat-tax would be too crazy to ever pass, even in these days of the right-wing noise machine, so they tacked on just enough compassion for the poor to try and make it salable. But they still kept the name flat-tax, in order to try and pass the idea off as some sort of fairness (there's that word again) plan, rather than simply being a plan to tax the rich less and the poor more. You have to admire the ingenuity of the right-wing folks who are constantly advocating for lower taxes for the rich. I mean, I guess you have to be imaginative if you want to push an agenda which runs counter to the interest of a large majority of the population, but still. Anyway, when you hear people advocating for a flat tax I recommend asking them two questions: 1) Do you mean a flat tax or a two bracket tax? When they admit that it is really a two-bracket plan they support you can ask: 2) Why are two brackets better than five? If one acknowledges the marginal decrease in harm caused by taxes as income rises, how does one contend that this effect disappears at a mere $8,000/year of income? The other day, the Globe and Mail ran a story about a study from the Canadian Centre For Policy Alternatives (CCPA) and they even linked to the study itself, shockingly enough. The study was basically an exercise in pointing out the obvious. Over the last few decades the wealthy have received an increasing portion of income in Canada. Looking at inflation adjusted figures, only the top few deciles have been making ground while the bottom half of society has mainly been treading water despite working longer hours. And this trend has accelerated in the last decade. Today, John Ibbitson has a column in the Globe and Mail today about how we should dismiss all reports from biased think tanks. I have to wonder with amusement just how many breathless reports on Frasier Institute and C.D. Howe Institute studies he let pass in silence before deciding now was the time to take a stand, but really, if the CCPA can get people to disregard all think tank reports the left-wing will probably take that as a win, kind of like Rory Fitzpatrick drawing Alex Tanguay into equalizing penalties during a Canucks-Flames matchup. Governments that took this report at its word would increase upper-income taxes, raise the minimum wage, bolster union rights, and increase subsidies to manufacturers. Throughout the 1970s, 1980s and early 1990s, governments did all those things. In the process, inflation, unemployment and deficits grew, while recessions came and went and came again. Desperate, governments began cutting taxes, reining in inflation (through the central bank) and balancing budgets. The results were spectacular. Growth took off, along with the incomes of those who were responsible for that growth: entrepreneurs and highly skilled workers who added the most value to the economy. The left-wing think tanks ignore this reality. There's a whole lot of wrongness crammed into these few paragraphs so let's take things slowly. 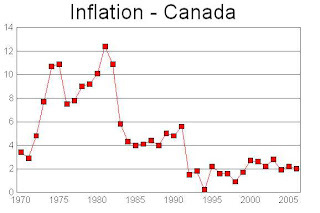 First of all, Ibbitson says that, "Throughout the 1970s, 1980s and early 1990s ... inflation .. grew, while recessions came and went and came again." Looking at the chart, keep in mind that the recessions Ibbitson is talking about (e.g. the ones which have afflicted every capitalist society since the dawn of capitalism) occurred in the early 80's and early 90's. As you can see, far from rising gradually over time as a function of pro blue-collar policies, inflation was introduced into the system in a pair of shocks in the 70's primarily related to oil prices, and probably also related to the U.S. departing from the gold standard and the collapse of the Bretton Woods currency management regime. After this initial shock, Ibbitson is right that governments, or rather the central banks, reduced this inflation. But rather than being an event which occurred in the mid-90's and triggered growth, as Ibbitson argues, the decrease in inflation was clearly brought about via the two recessions in which interest rate increases (by the central banks) drove up unemployment lowering workers wage claims and reducing total demand, thus leading to lower prices - i.e. less inflation. All this is fairly commonly known so it is surprising that a political columnist for a major paper like the Globe would be unaware of some of the most important economic events of the last 30 years. 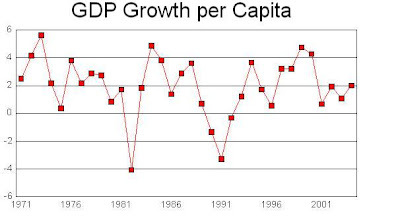 As you can see, contrary to Ibbitson's argument that economic growth in the late 90's was caused by cutting taxes, the record shows that taxes were steady during this period. 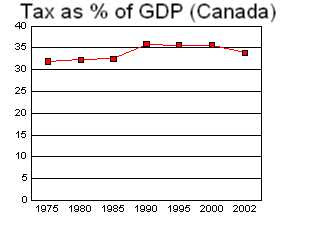 Only after 2000 (when the Liberals brought in a massive tax cut) does tax as a percentage of GDP begin to decline. Now, if you're thinking that growth started to pick up in the 90's and got stronger after 2000 then this would actually strengthen your case, but we'll get to that in a minute. Ibbitson also argues that the 'low growth' period of the 70's, 80's and early 90's corresponded with government increases to the minimum wage, whereas the 'spectacular' results from the mid 90's on, presumably corresponded with a decrease in the minimum wage (or fewer increases). However, as we can see from this report, the 'low growth' period was marked by substantial decreases in the minimum wage, whereas the 'spectacular results' period was when governments arrested the decline in minimum wage rates and began to increase them again. I don't have the expertise to assess whether the 70's, 80's and early 90's were marked by governments making efforts to 'bolster union rights, and 'increase subsidies to manufacturers.' as Ibbitson claims, but it seems unlikely to me. Finally let's recall what Ibbitson says happened as a result of all this: "Desperate, governments began cutting taxes, reining in inflation (through the central bank) and balancing budgets. The results were spectacular. Growth took off"
OK, we dodged technically being in recession in 2000, but growth was pretty weak for a few years there. I'd be hard pressed to agree with an assessment of the last few points on the graph as 'spectacular results' or growth 'taking off.' Note that the weak growth in the 2000-2003 period was in the aftermath of the big 2000 tax cuts. 3) however, based on an interpretation of the last 35 years of economic history which is wrong both in its effect ('stagnation followed by spectacular results') and in the cause of the non-existent effect (steadily rising inflation, union power and minimum wages followed by cuts to taxes and minimum wages) Ibbitson concludes that governments would be crazy to act on the report's recommendations.